Good Samaritans Thad Hoffman, right, and Matt Pronovost dig a car out of the snow bank Friday morning after the car got buried by a plow. STEAMBOAT SPRINGS — If you didn’t have a big smile on your face this morning, you live in the wrong town. Steamboat Resort’s 5 a.m. report tallied 13.5 inches at mid-mountain in the past 24 hours, with 13 of that falling after lifts closed Thursday. Since 5 a.m., an additional 8 inches have fallen at the summit, and snow is expected to continue throughout the day. The morning snow report is the deepest since Jan. 5, 2017, when Steamboat Resort recorded 20 inches at midmountain. Combined with Thursday’s 6-inch report, the official two-day storm total sits just shy of 20 inches. A winter storm warning is in effect until 6 p.m. Friday across the Yampa River basin, according to the National Weather Service. Heavy snowfall, blowing snow and difficult travel conditions are expected throughout the day, with the storm forecast to move out of the area Friday night. 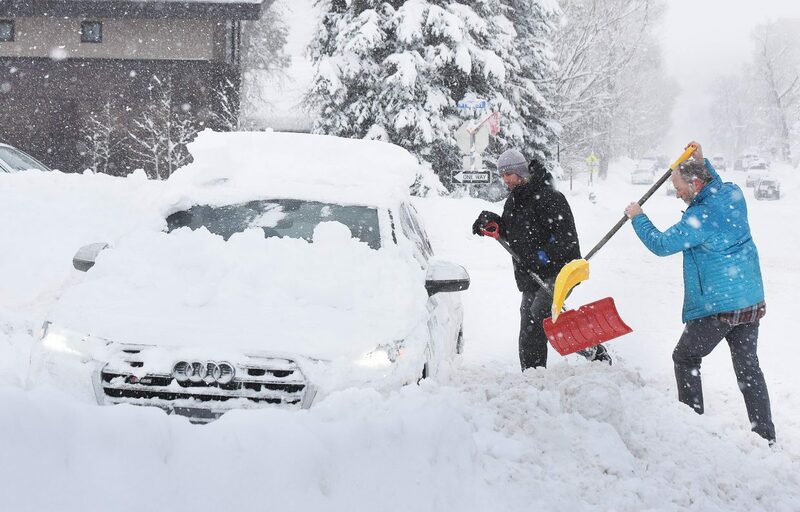 “What we’re thinking is that the snow is going to continue for most of today, and it’s probably going to let up this evening and go to scattered snow showers by about midnight,” said Chris Cuoco, a meteorologist with the National Weather Service in Grand Junction. Cuoco said meteorologists in the office were watching the snow cameras in Steamboat and expected the area to pick up another 2 to 3 inches in town and 4 to 6 inches on the mountain before the storm moves out. The heavy snowfall also brought with it an avalanche warning for the Steamboat and Flat Tops areas, according to the Colorado Avalanche Information Center. Large naturally and human-triggered avalanches can be easily triggered on slopes steeper than 30 degrees, according to the report. “The only way to stay safe is to avoid avalanche terrain,” the warning states. The avalanche warning is in effect until 8 a.m. Saturday.